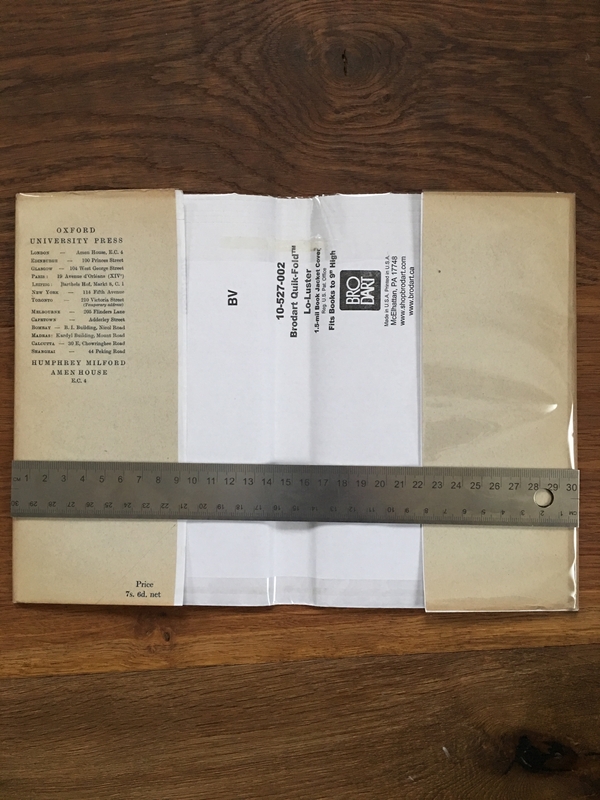 Given that we don't know what the Dust Jacket actually looked like (other than Perhaps Wayne who has seen one), I'm trying to make something plausible just to protect the spine of the book from UV on the shelf. I can figure out the correct size easily enough (as I know how wide the flaps were from shadowing on the endpapers). Could you make one for me as well, let me know costs? Yep. I'm looking to get all the correct addresses for the flap at the mo. May end up stuck for Leipzig, Shanghai and Copenhagen. I can source all the others, probably as they were at the time (definitely from 1936 at any rate). 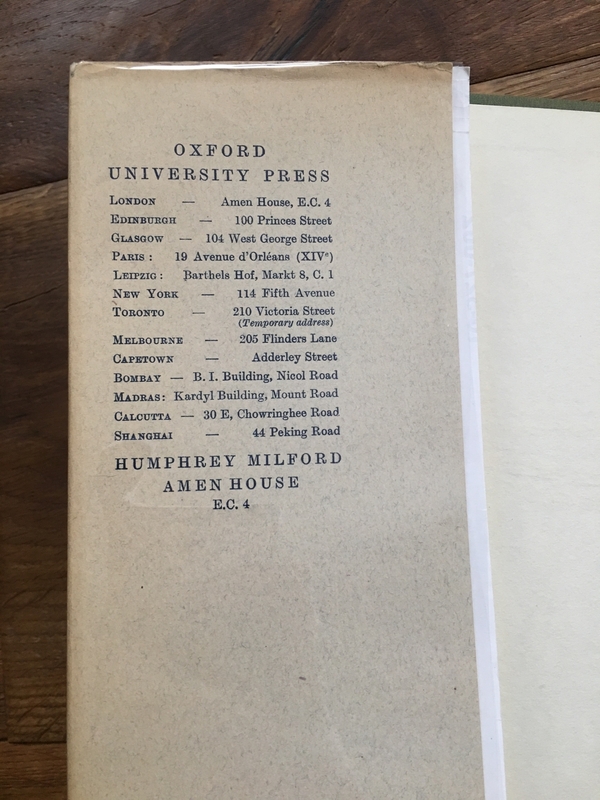 If anyone has any OUP books from the 20s that have the addresses, chiming in would be appreciated. This title, also from 1928, likely has the same flap text. I've asked the seller if he might be able to email me a photo. 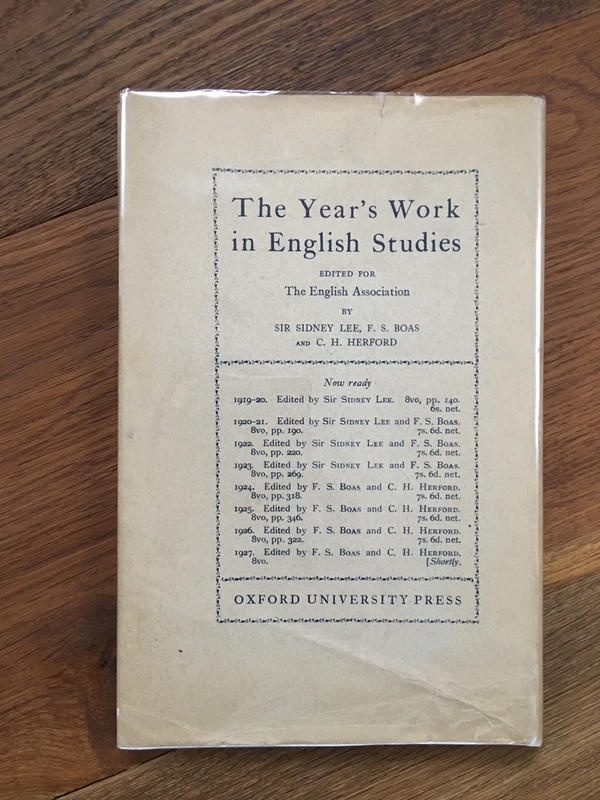 Also found another 1928 OUP book with jacket that has the same list (also obscured), so hopefully one of them will help out. I would also be interested in this dust wrapper, Stu! Cannot help, but would love a facsimile copy if you do produce them. Thanks for the effort (and to Ithildin and other for their help as well)! ...and here you have the correct size of both flaps. But I don't suppose that the selling price was the same. 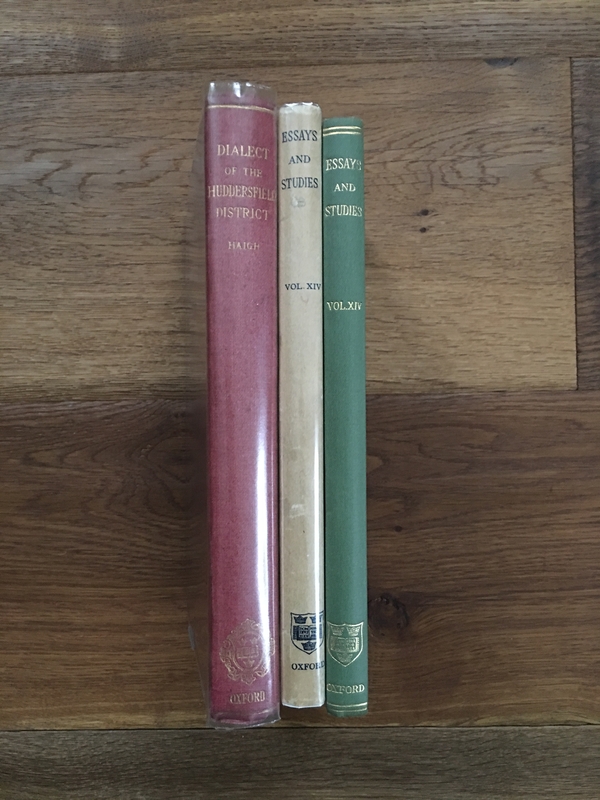 Stu, looking at your suggested spine, I think the text is more likely written in the same manner as on the book spine. 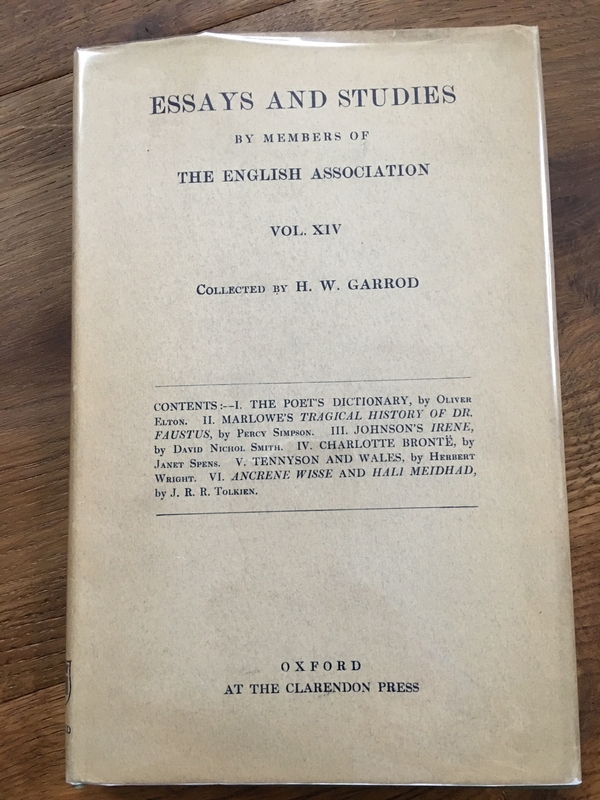 Please compare the style on 'Essays' book and dustwrapper. And what's about the back side...? As far as I know, there were printed two versions of the book, concerning the front book cover: with and without the gild coat of arms. Would't it be more plausible that the dust wrapper was the same for both variants, but more likely without this decoration? What do you think? The price noted in the Bibliography, but unknown if on the DJ, was 12s. 6d. 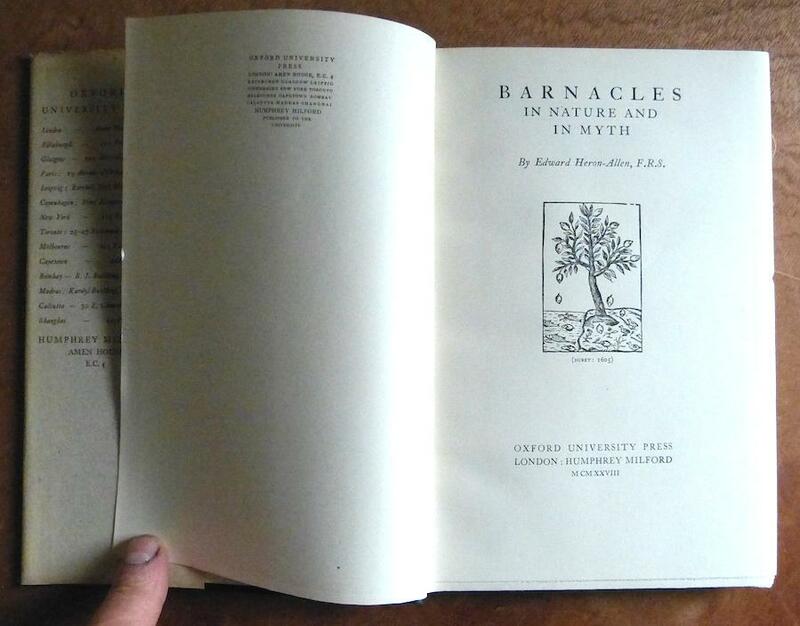 My copy does not have the coat of arms on the title page - instead it has an "about the author" blurb. This agrees with Hammond's description. So I think the coat of arms does not appear on the DJ cover either, based on this. You only have 13 addresses, Hammond mentions 14. Also the publisher addresses are noted as on the front flap, not the rear. Also, I wonder if we can recreate the list of 5 books advertised on the rear cover, based on publishing data from OUP at this time. My copy does have the gild coat of arms on the binding, but it is very small and you need a magnifying glass to see the detail, I agree that it was probably not on the dustjacket, as if it was at the same size you still can not easily read it. I think that the coat of arms was on the binding of some copies of the book, not the title page.